Candida, bloated stomach, irritable bowel, leaky-gut, skin disorder, continuous constipation or diarrhoea and lack of oxygen and energy. This is a uniquely formulated colon conditioner which is fast acting and is scientifically designed to work gently, safely and effectively without bulky fibre, chalky taste or harsh side effects. OxyTech breaks debris in the colon into very small pieces that can be easily and gently eliminated. A clean and healthy colon can lead to more effective absorption of vitamins, minerals and nutrients. In OxyTech, Ozone (03) and Oxygen (02) are bonded to magnesium. 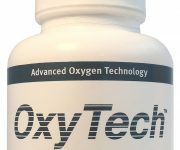 When the OxyTech capsules are ingested with water in the stomach, the bonding between the magnesium and the oxygen molecules is cleaved and the oxygen is absorbed by the blood, lymph and cellular fluids very quickly. OxyTech breaks debris in the colon into very small pieces that can be easily and gently eliminated. A clean and healthy colon can lead to more effective absorption of vitamins, minerals and nutrients. 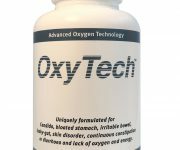 OxyTech is the most powerful user-friendly oxygen therapy you can buy to revitalize your colon.